This spacious ocean bluff condo, unit 109, called 'Queens Hideaway' has sweeping views of the Pacific and is now totally refurnished by interior designers to become the most elegant and comfortable unit in Pu'u Poa! Modern, large lounging sectionals and updated furnishings add luxury and comfort to your stay. Modern stone enhances the large gourmet kitchen while the master bath boasts a large double shower. Privacy and ocean/Bali Hai views enchant our guests as whale and dolphin watching is a favorite pastime. It's all about location and Pu'u Poa has one of the few ocean side units that are amongst the amazing beauty of the North Shore of Kauai. The most beautiful beaches, tropical mountain vistas and enchanting waterfalls among exotic jungle folage. Also located next to the 5 star St. Regis Hotel, guests can walk over for an elegant dinner and tropical drinks with sweeping Bali Hai views. This condo gets its name from Hideaways beach, a secluded beach, which is directly below the condo, down a fun hiking trail. This beach is the perfect place to watch thrilling surf or snorkel with the turtles, depending on the ocean’s mood. Also, from Queen's Bath, one of the most unique and refreshing swimming areas on the island. The 'pool' is carved into a lava shelf and is the size of several large swimming pools and is located just down the street and down a majestic hiking trail. * Lamps,coffee tables, rugs all upgraded * Large gourmet kitchen! * Marble counters in kitchen and bathrooms. Come stay in this luxury, spacious and extra large home for less the cost of a hotel room. Queens Hideaway sleeps up to 6 people, on one king, one queen and a queen sleeper sofa. Growing up in Seattle I always dreamed of beaches, tropical scenery and warm days and star filled warm nights. I have traveled to many of these types of places but feel that the north shore of Kauai is the most beautiful I've seen. When I'm at our condo the beauty and serenity make me truly feel like I'm in paradise. I absolutely loved the views of the Ocean, Bali Hai and the mountains with majestic waterfalls....I felt I could not find a more beautiful setting and loved the modern, open floor plan with large lanais for eating and entertaining. Location, location, location! This unit and the complex has it all! There are not many ocean front condos on the north shore...and this one is tops them all! Rated in the top 2 snorkeling beaches in Kauai! This spacious condo is a delightful homebase for a week in Kauia, beautifully and warmly decorated and well-equipped for both beach adventure and dinner preparation. Covered outdoor porch with full size table, large sitting area, and grill is a clear bonus room. Some minor maintenance questions were quickly resolved on site, as owners were very responsive and accomodating. Very much endorse this well-situated and scenic VRBO choice! The condo has anything you need. Lot of space to cook and every appliance works well. It is quiet all day and night. You should fixed the dishwasher to the cupboard, it's only two screws and it would prevent the dishwasher from falling anytime we pull on a tray. There was a family of NeNe (6) on our stay and they would come on the patio frequently so you can't eat there. The trail for Hideaways beach is not praticable for 60 years old people. My wife and my youngest daughter went but I could not make it even if I tried. The beds are confortable, TV works well and a lot of channels. It was mainly on NFL Channel all week for me. We went to eat at St-Regis 2 times and it was worth it. At the Mahana Terrace for breakfast and Kauai Grill for dinner. The road is closed after Hanalei since the floods of april 2018 and that should be mentionned on your website. There was a flash flood when we were in the condo and could not go west from the condo, only east toward Kapaa. The only really concern about your condo is the internet Wi-Fi reception. It is not acceptable, in 2018, to have that poor connection. We travel all over the world and that was one of the worst connection we had. Yes, we had 4 to 6 laptop/iPhone connecting but it is not a problem in the USA mainland, in Europe, in Australia/New Zealand. Even with only my laptop using the internet at 04:00 am the connection was poor. Sometimes, I had to go on the patio to get the 3G from AT & T on my iPhone and share the connection to the PCs for service. There is no reception from AT & T in the condo but this is not your fault (probably the configuration of the building). Maybe your internet provider does give only poor service but if possible, upgrade to the fastest available, whatever the cost and ask for a higher rent. Thanks so much for your nice review. Just to clear up some of the items you mentioned. The road north to hannelei and further north is open and has been for quite some time so to say it’s been closed for over a year is misleading and just plain wrong. Please check facts before writing incorrect information. There are boughts of rain in which the old bridge can be closed for short periods of time which is unpredictable. We do have the most expensive Wi-fi but the general area does cause some slowness and can be weather effected and that’s the area not our just our condo. You should have called to get correct information. We are always available and eager to help our valued guests! Great location with an awesome lanai. Great sunset views, with easy access to the trailhead for one of the best beaches in the area (hideaways). Loved being able to use a very nice kitchen and relaxing on the lanai for breakfast and dinner. Would recommend to anyone!!! Pure Paradise! Can't Wait To Go Back! The rental is amazing and everything we could have hoped for! The sunset views are breathtaking, the space itself is spotless and you feel at home the minute you walk in. They have everything you need for the beaches, snorkeling, cooking and grilling. Can't say enough good things. Also, we did a combination of eating out at restaurants and cooked at home and found that Three Brothers Gourmet Market has the most amazing fresh fish and steaks. This condo is beautifullied decorated and has a fully stocked kitchen. It had everything we needed to be comfortable and even some family games like Scrabble. The views are fantastic and the sunsets never get old. There is no AC in the unit but plenty of ceiling fans and other standing fans to help keep things manageably cool. We loved the outdoor deck and grilled most evenings. The unit is also a few minutes from the St Regis, which had a beautiful beach on one end of Hanalei Bay. This was a bit easier for us to get to than the somewhat difficult short hike down to the hidden beach. My only minor complaint would be the size of the community pool. It’s small. My girls felt pretty self conscious about having fun and making any noise due to older adults in such close proximity. We were there only for a couple of hrs the whole 5 days we were there. Other than that, the unit is a great vacation rental. Very well appointed condo with everything, and then some, for a great Kauai vacation. 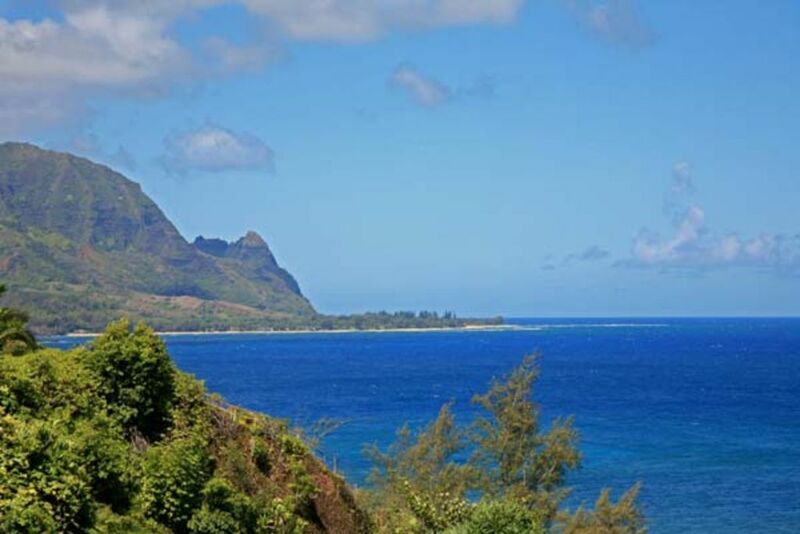 Close to the St. Regis Hotel an Princeville golf courses. Wonderful ocean and Mountain View’s of Makana (Bali Hai). If booking is within 60 days prior to arrival date then total funds are due upon booking. We accept both credit card payments and e-check payments but prefer e-check payments...it saves both you and I around 2% fees from credit card transactions. Please note: stays over 5 nights and with over 3 people require a mid term cleaning.